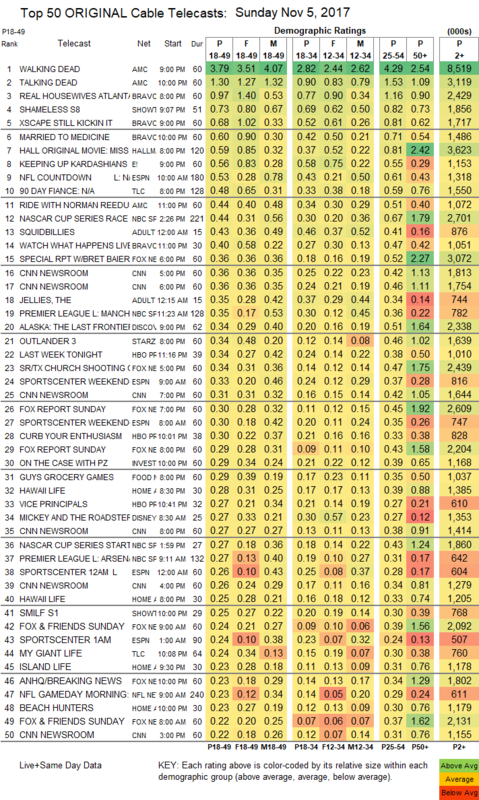 NETWORK FINALS: SUNDAY NIGHT FOOTBALL adjusted to 4.9, up 0.1 from last week’s final. Elsewhere, on CBS, 60 MINUTES gained 0.1 and MADAM SECRETARY lost the same, while on FOX, BOB’S BURGERS fell 0.2 after football adjustment and FAMILY GAME rose 0.1. CABLE HIGHLIGHTS: AMC’s THE WALKING DEAD remained dominant, although it slid by another 0.20 to 3.79, with TALKING DEAD down a tenth to 1.30, and a Sunday season premiere of RIDE WITH NORMAN REEDUS (which then moves to Mondays) at 0.44. Showtime’s SHAMELESS, despite airing directly against WALKING DEAD, had a terrific season premiere at 0.73, up 0.24 from the 2016 premiere (which only had to face FEAR THE WALKING DEAD). This helped the series premiere of SMILF, which lost most of its lead-in at 0.25, but was still way ahead of other recent Showtime half-hours, and followed 2 weeks of online/VOD availability. Lead-out WHITE FAMOUS also benefited, up 0.05 to 0.12. Hallmark’s holiday movie MISS CHRISTMAS was healthy at 0.59. On Adult Swim, SQUIDBILLIES edged up 0.02 to 0.43, and THE JELLIES held at 0.35. On Starz, OUTLANDER ticked up to 0.34, and the season premiere of THE GIRLFRIEND EXPERIENCE was at 0.10/0.08 in its new back-to-back half-hour format, on par with last year’s 0.11/0.11 premiere. On HBO, LAST WEEK TONIGHT gained 0.03 to 0.34, CURB YOUR ENTHUSIASM rose 0.04 to 0.30, and VICE PRINCIPALS was up 0.04 to 0.27. TNT’s GOOD BEHAVIOR was steady at 0.13. The season premiere of Bravo’s REAL HOUSEWIVES OF ATLANTA led the unscripted side at 0.97, with XSCAPE: STILL KICKIN IT at 0.68, and the season premiere of MARRIED TO MEDICINE at 0.60. On E!, KEEPING UP WITH THE KARDASHIANS had a 0.14 bump to 0.56, and WAGS returned at 0.20. On TLC, 90 DAY FIANCE had a 2-hour episode at 0.48 compared to last week’s 0.58/0.47, and MY GIANT LIFE was down 0.04 to 0.24. NBC Sports Net’s NASCAR race was at 0.44. On Discovery, ALASKA: THE LAST FRONTIER ticked down to 0.34, and EDGE OF ALASKA was down 0.08 to 0.20. On ID, ON THE CASE climbed 0.07 to 0.29. 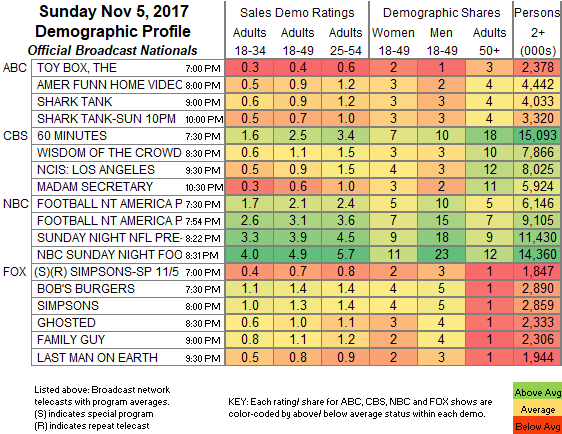 On Food Network, GUY’S GROCERY GAMES was steady at 0.29, and GUY’S BIG PROJECT premiered at 0.18, followed by the premiere of VEGAS CAKES at 0.16/0.14. HGTV’s line-up was led by HAWAII LIFE at 0.28/0.25, compared to last week’s 0.26/0.22.